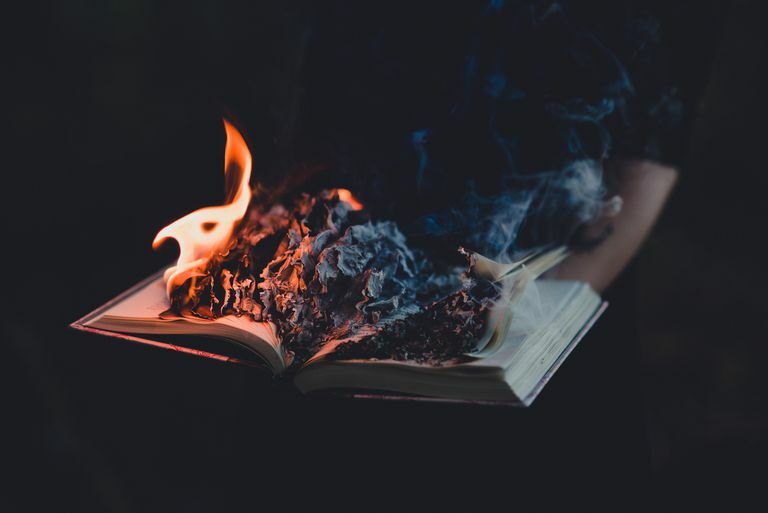 Ray Bradbury’s 1953 novel Fahrenheit 451 is set in a dystopian society that burns books in order to control dangerous ideas and unhappy concepts. The novel tells the story of Guy Montag, a fireman who questions the book-burning policy and undergoes extraordinary suffering and transformation as a result. When the novel begins, fireman Guy Montag is burning a hidden collection of books. He enjoys the experience; it is "a pleasure to burn." After finishing his shift, he leaves the firehouse and goes home. On the way he meets a neighbor, a young girl named Clarisse McClellan. Clarisse tells Montag that she is "crazy" and she asks Montag many questions. After they part, Montag finds himself disturbed by the encounter. Clarisse has forced him to think about his life instead of simply offering superficial responses to her questions. At home, Montag discovers his wife, Mildred, unconscious from an overdose of sleeping pills. Montag calls for help and two technicians arrive to pump Mildred's stomach and perform a blood transfusion. They tell Montag that they no longer send doctors because there are so many overdoses. The next day, Mildred claims to have no memory of the overdose, believing she went to a wild party and woke up hungover. Montag is disturbed by her cheer and her inability to engage with what happened. Montag continues to meet Clarisse almost every night for talks. Clarisse tells him that she is sent to therapy because she does not enjoy the normal activities of life and prefers to be outside and to have conversations. Some weeks later Clarisse suddenly stops meeting him, and Montag is saddened and alarmed. The firemen are called to a book hoarder’s house. An old woman refuses to give up her library, and the firemen break in and begin to tear the house apart. In the chaos, Montag steals a copy of the Bible on impulse. The old woman then shocks him by setting herself and her books on fire. Montag goes home and attempts to engage Mildred in conversation, but his wife’s mind has regressed and she is incapable of even simple thoughts. He asks her what happened to Clarisse and she is able to tell him that the girl was hit by a car and killed a few days prior. Montag tries to sleep but imagines a Hound (a robotic assistant to the firemen) prowling around outside. The next morning, Montag suggests he might need a break from his work, and Mildred panics over the thought of not being able to afford their home and the large wall-sized televisions that provide her "parlor wall family." Hearing of Montag’s crisis, Montag’s boss, Captain Beatty, explains the origin of the book-burning policy: because of shortening attention spans and increased protest against various books' content, the society decided to voluntarily dispense of all books in order to prevent future trouble. Beatty suspects Montag has stolen a book, and tells Montag that a fireman who has stolen a book is usually given 24 hours to burn it. After that, the rest of the firemen will come and burn down his house. After Beatty leaves, Montag reveals to a horrified Mildred that he has been stealing books for a while, and has several hidden away. She attempts to burn them, but he stops her and says they will read the books and decide if they have any value. If not, he promises to burn them. Montag hears the Hound outside the house, but tries to force Mildred to consider the books. She refuses, angry at being forced to think. Montag tells her that something is wrong with the world, that no one is paying attention to the bombers overhead that threaten nuclear war, and he suspects books might contain information that could help fix it. Mildred becomes angry, but soon gets distracted when her friend Mrs. Bowles calls to arrange a television viewing party. Frustrated, Montag telephones a man he’d met many years before: a former English professor named Faber. He wants to ask Faber about books, but Faber hangs up on him. Montag goes to Faber’s house via subway, taking the Bible with him; he attempts to read it but is constantly distracted and overwhelmed by the advertising being played incessantly. Faber, an old man, is suspicious and afraid. He initially refuses to help Montag in his quest for knowledge, so Montag begins to rip pages from the Bible, destroying the book. This act horrifies Faber and he finally agrees to help, giving Montag an earpiece so that Faber can guide him verbally from a distance. Montag returns home and interrupts Mildred's viewing party, turning off the parlor wall screens. He tries to engage Mildred and their guests in conversation, but they are revealed to be thoughtless and callous people who don’t even care for their own children. Disgusted, Montag begins reading from a book of poetry despite Faber’s pleas in his ear. Mildred tells her friends that this is something firemen do once a year to remind everyone how terrible books and the past were. The party breaks up, and Faber insists that Montag burn the poetry book to avoid arrest. Montag buries the rest of his book collection and takes the bible to the firehouse, handing it to Beatty. Beatty informs him that he himself was once a book-lover, but he realized that none of the knowledge in books was of any real use. A call comes in for the firemen and they climb onto the truck and race to the destination: Montag’s house. Beatty tells Montag that his wife and her friends reported him. Mildred leaves the house in a daze and gets into a taxi without a word. Montag does as ordered and burns his own house down, but when Beatty discovers the earpiece and threatens to kill Faber, Montag burns him to death and attacks his fellow firemen. The Hound attacks him and injects tranquilizers into his leg before he can burn it as well. As he limps away he wonders if Beatty had wanted to die, and set up Montag to kill him. At Faber’s house, the old man urges Montag to flee into the wilderness and make contact with the Drifters, a group of people who have escaped society. They see another Hound being released on television. Montag meets the drifters, who are led by a man named Granger. Granger tells him that the authorities will fake Montag’s capture rather than admit to any flaw in their control, and sure enough, they watch on a portable television as a another man is identified as Montag and executed. The Drifters are former intellectuals, and they have each memorized at least one book with the intention of carrying its knowledge into the future. As Montag studies with them, bombers fly overhead and drop nuclear bombs on the city. The Drifters are far enough away to survive. The next day, Granger tells them about the legendary Phoenix that rose from the ashes, and muses that humans can do the same, except with the knowledge of their own mistakes to guide them. The group then begins walking towards the city to help rebuild society with their memorized wisdom.